If you're looking for a traditional gift to bring home from Tokyo Sou Sou is the perfect place to add to your list. 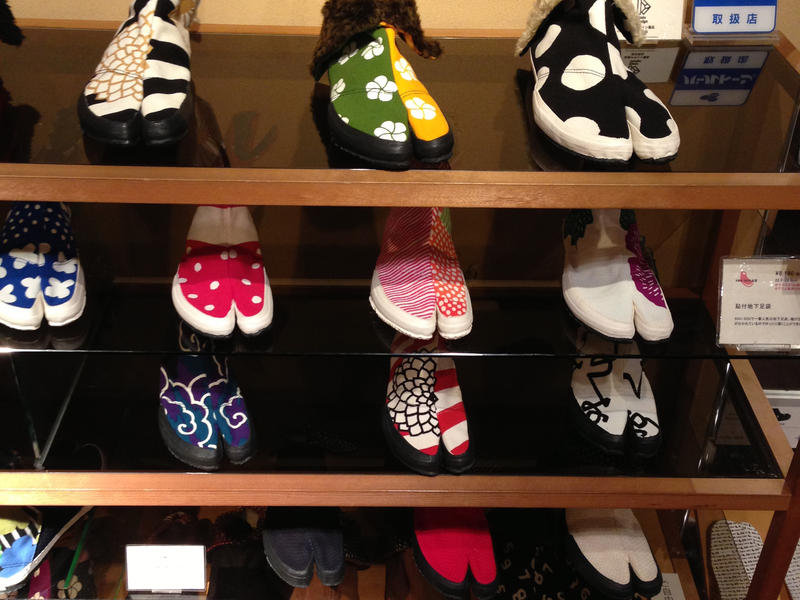 Sou Sou is a shop in Tokyo that specializes in "Jika-Tabi" shoes, a type of traditional Japanese slipper sock that separate the big toe. The Jika-Tabi was the original footwear of Ninjas during the 10th century, because Samurai felt the split helped the wearer spread their toes wider, feel the ground beneath them better, and improve the wearers overall balance. Sou-Sou makes their "Jika-Tabi" shoes with rubber soles, that make them even more comfortable on today's surfaces. Consequently, you'll find many gardeners love the jika-tabi for their comfort and ease, which makes them the perfect gift for the a budding gardener in your life, or a Ninja in training! Sou Sou is one of the only companies in Japan that consistently produces this modern take on historic Japanese footwear, so it really is worth it to check them out. Like a lot of other Japanese brands, Sou Sou crafts their shoes by hand, with careful attention to detail and quality. Sou Sou also produces a line of 'Zori' or 'Geta' (the traditional Japanese thonged sandal), however they're not nearly as practical and comfortable as the Jika-Tabi. You'll find Tabi shoes in conservative colors like black, white and brown, but also in playful and trendy prints, so you'll have no trouble finding the look that suit you. If you don't know Japanese you probably assume the name "Sou-Sou" means sock or sandal, well it doesn't. The name actually comes from the Japanese phrase "yes, yes" which acts as sort of Japanese confirmation that's regularly used in every day conversation. "Sou, Sou" is something unique to the Japanese language (like "Prego, Prego in Italian), and much like the phrase "sou, sou" these traditional shoes and socks are also unique to Japanese culture.